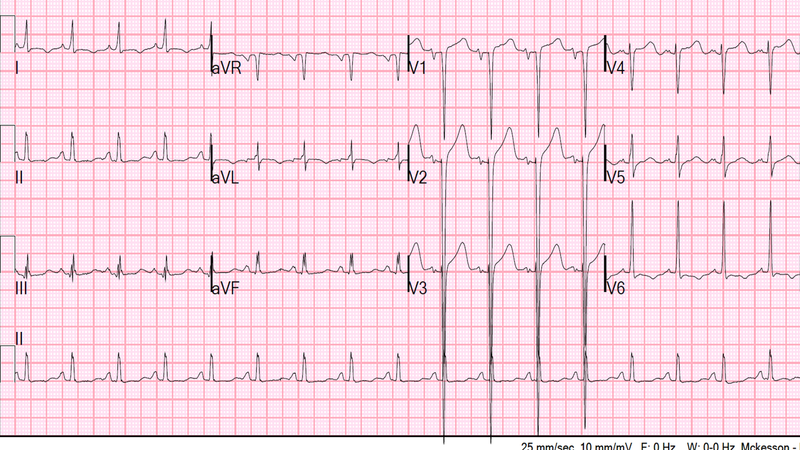 Dr. Smith's ECG Blog: ST Elevation and Positive Troponin. Is it STEMI? No. And it is not even ACS. ST Elevation and Positive Troponin. Is it STEMI? No. And it is not even ACS. There is sinus tach at a rate just above 100. There is profound LVH, with deep S-waves in V1-V3 and a large R-wave in V6. There is left atrial enlargement, with a very large negative deflection of the P-wave in V1, also supporting LVH. There is 3-4 mm of ST elevation in V1-V3: this is classic for the pseudoSTEMI pattern of LVH: 1) location: V1-V3 and 2) preceded by a deep, high voltage S-wave. Armstrong et al., concluded that an ST/S ratio of less than 0.25 in the presence of LVH is very unlikely to be due to STEMI. There are small Q-waves in III and aVF that suggest, but are not diagnostic of, old inferior MI. Although this ECG is abnormal, I see no evidence of ischemia on this ECG. It is nondiagnostic. There certainly could be ischemia hidden in this ECG. But there is nothing specific for ischemia. And it is not an ECG that should result in cath lab activation. It is very similar but at a higher heart rate. But there are also clearly inferior Q-waves, strongly suggesting that he had a pre-existing inferior MI. This proves that the baseline ECG has high ST elevation in V1-V3. But you did not need to see this previous ECG to know that the ST elevation on the presenting ECG was due to LVH! This amount of ST elevation is APPROPRIATE for an ECG with such deep S-waves. In LVH, as in LBBB, the ST elevation in precordial leads is appropriately discordant, but if it is baseline, it should be proportionally discordant. As indicated before, Armstrong's research suggests that an ST/S ratio of 0.25 is an appropriate amount of proportional discordant ST elevation. The hypertension and tachycardia could be due to, among other things, clonidine withdrawal: the abrupt withdrawal of clonidine can result in rebound central sympathetic outflow, with increase in both blood pressure and heart rate. The patient was administered clonidine which resulted in a modest improvement in his vital signs. The patient was not started on metoprolol in the ED, but was (appropriately) given Nitroglycerin. Nitro may lower the BP, but won't lower the heart rate, and both cause increased oxygen demand with ischemia. His pain continued. An echocardiogram was ordered and done in the ED just before the patient was transported upstairs. The report returned as a large inferior wall motion abnormality (WMA) with extension to the lateral wall. (There was also "Abnormal left ventricular diastolic performance grade 3, Severe restrictive pattern)" This is consistent with the LVH on the ECG. It was unknown for certain if the WMA was new or old. He was started on carvedilol 25 mg po bid at admission. His pain abated and he was taken to cath the next morning, at which time a 100% occlusion of a small dominant distal circumflex was found (to the inferior wall). It could not be crossed with a wire. It appeared to be a chronic total occlusion. There was good collateral circulation and it was a very small vessel. The peak troponin was only 0.270 ng/mL. Now the heart rate is slower and there is only 2-3 mm of ST elevation in lead V2. It is very common for tachycardia (ECG above) to result in more ST elevation than is present at baseline. There is still no sign of an infarct. He was taken off clonidine and started on lisinopril and carvedilol. 2. MI and ischemia due to a coronary event is usually subendocardial ischemia and the ECG is usually nondiagnostic, or has ST depression of subendocardial ischemia. 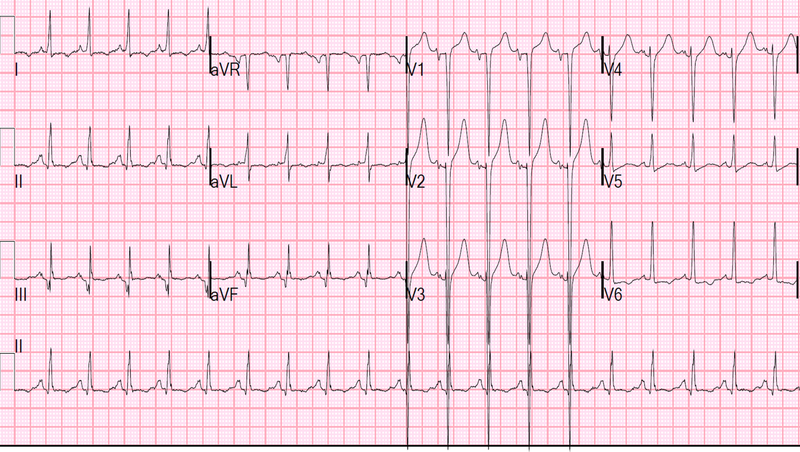 ST elevation is possible, but very unusual. I tryed the formula STE/R-S in the few exemples given in the article of Armstrong "Electrocardiographic Criteria for ST-Elevation Myocardial Infarction in Patients With Left Ventricular Hypertrophy", and i haven't the same results, neither for the positives nor the negatives cases. I'd like to know whether the patient was put or not on an antiplatelet drug as aspirin. In my opinion it might have been the case because there was evidence of a prior MI. I freely give aspirin to anyone who might even have a small chance of ACS, unless there is allergy. It is a very benign yet incredibly effective medication. T wave inversion in lead 1& aVl due to LVH or reciprocal?? Both. III and aVL are 150 degrees from each other and so are always reciprocal. I know it's confusing. A hyperacute T-wave in III will show as an inverted T in aVL. 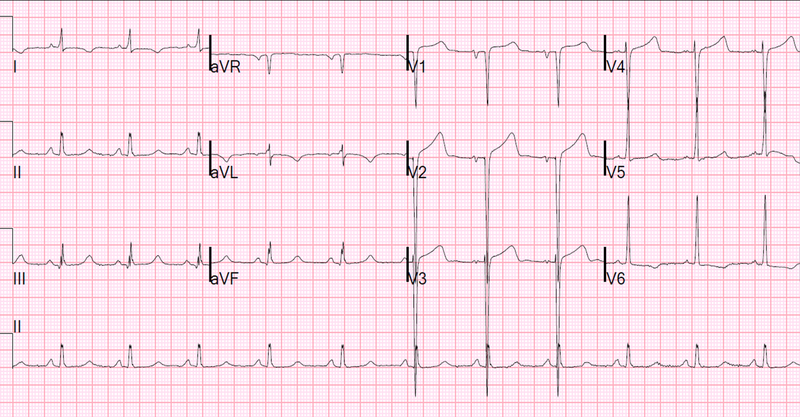 A hyperacute T-wave in aVL will show as inversion in III. Whichever wall has the most voltage will predominate and the opposite (reciprocal) wall will mirror it.